I was born in 1982 in Mobile, Alabama. I have always been proud to be from Mobile. The city is not only my hometown, but also the hometown of my maternal family going back several generations. Since leaving Mobile as a teenager, I have returned to spend time in the Azalea City each year and look forward to continuing to do so with my children for many years to come. Mobile has a sterling reputation as a center of Southern hospitality and has long been a center of diversity along the Gulf Coast and throughout the Southeast. Even so, I would not describe Mobile, or the state of Alabama, as the most welcoming of cities. 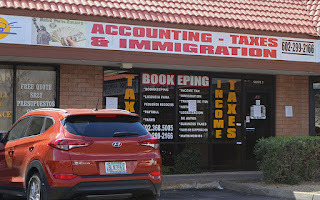 In fact, living outside of Alabama, I can attest to the fact that the state's national and international reputations took major hits with the ill conceived immigration bill, HB 56 in 2011. This is unfortunate, because Mobile has been a city of immigrants with a diverse population going back to it's earliest roots. In fact, Mobile was founded as a form of cooperative between French colonists (immigrants themselves) and Mauvila Indians in 1702. The colony's initial inhabitants included people of European, African and American heritage. The city changed hands between the French, British and Spanish monarchies until becoming a part of the United States in 1813. Each European nation provided its own wave of immigrants and African slaves to the city such that by the time Mobile became a part of the newly formed state of Alabama in 1817, it had already become truly multicultural, a trait that has distinguished Mobile from the rest of Alabama ever since. 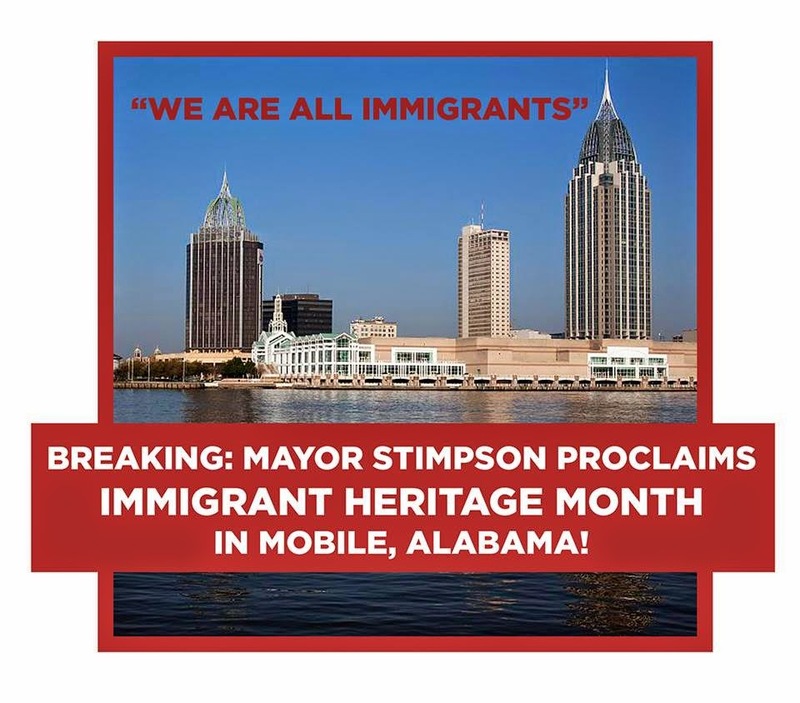 This is why it was so refreshing to see Mayor Sandy Stimpson declare June "Immigrant Heritage Month" in Mobile. 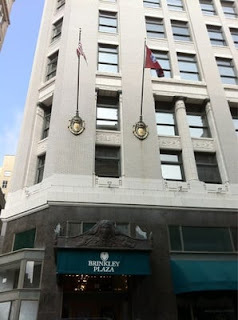 In doing so, Mayor Stimpson recognized the city's unique history saying, "Mobile is home to people from all over the world who contribute to the character of our city - culturally, economically and historically - and make the city what it is today." Could the "Home of Mardi Gras" become the "Home of Immigrants" as it once was? 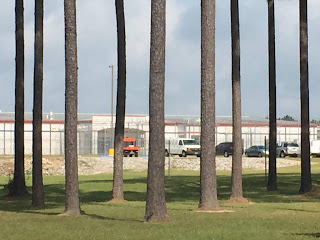 The effort behind the declaration was led in part by the Alabama Coalition for Immigrant Justice and the organization's South Alabama regional coordinator Frank Barragan. I know that merely proclaiming a month to remember a city's immigrant heritage is not going to fix our broken immigration system or motivate lawmakers to put aside their differences and actually work to solve the the immigration conundrum. The mayor of Mobile, Alabama declaring a month to remember the city's immigrant history will have no impact on the women and children detained in Artesia, NM, it will not encourage lawmakers to pass a pragmatic comprehensive immigration reform bill and it will not cure the xenophobia behind much of the anti-immigrant movement today. Even so, with all the vitriol surrounding the immigration debate it is nice to see my hometown focus, not on the hate, but on the positive contributions immigrants have made, and still make, to the Port City. Hopefully Mobile, like so many other cities in the South and nation-wide, is starting to come to the realization that outsiders are not such a bad thing. Immigration is this nation's past, present and future. Growth in the United States is one thing that sets us apart from so many of the struggling economies in Europe. Immigration is not merely a national issue. At it's very core, immigration is a local issue. All feel the impact of new waves of immigrants to the cities and communities we call home. I am proud my hometown, while not changing the world, has made the decision to recognize and celebrate the contributions immigrants, my personal ancestors, have made. These are merely baby steps, but make me proud to be from Mobile. Nathan Bogart is the founder and managing attorney at Bogart Immigration Law, LLC a law firm based in the Kansas City metropolitan area focusing exclusively on immigration law, specifically removal defense and family-based immigration petitions.